The season of the Northern Lights begins as soon as bright summer nights are gone, in the beginning of September. Reflections in the river. This photo has been taken in March. 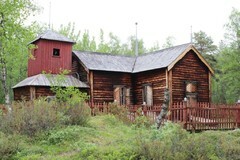 Ivalo Trek Lapland hasn´t any reception or safari house, we pick up you from your hotel in Ivalo area.